Ferrari recently introduced a Limited Edition Scuderia Spider sportscar and Scuderia 1/8th Second Limited Edition wristwatch. automatic mechanical, Panerai OP XXI calibre, 13 ¼ lignes, 42 jewels. Monometallic Glucydur® balance, 28,800 alternations/hour. Incabloc® anti-shock device. Power reserve 42 hours, Côtes de Genève decorations on the bridges. 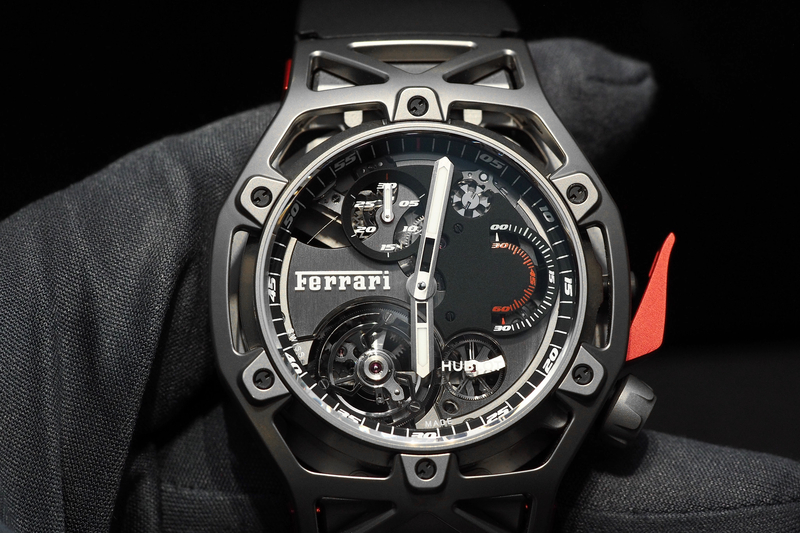 Rotor engraved with the prancing horse. hours, minutes, split-seconds chronograph with two counters, one with hand rotating once per second in 1/8 second increments, tachymeter scale. diameter 45 mm, in polished steel with brushed edges, screw-down chronograph push-pieces and winding crown with the Ferrari logo and rims worked with square-grid pattern. brushed steel with brushed finish. steel, screw-in, with sapphire crystal window decorated with a metallic grid; round the edge is engraved the inscription Engineered by OFFICINE PANERAI. black with the Ferrari shield applied at 12 o’clock, 60-minute scale with Arabic numerals at 5-minute intervals, tachymeter scale on the flange, minutes counter at 3 o’clock and 1/8th second dial at 9 o’clock with applied cone-section rings in metal, chronograph split-seconds at the centre. 1/8th second dial, minute counter and centre chronograph seconds hand in yellow, luminous baton hour and minute hands. sapphire, 1.9 mm thick. Anti-reflective coating. rubber strap with the incised inscription Ferrari, personalised folding buckle in brushed steel with the edge of the closure in polished steel. Spare strap in black calf with contrasting stitching, inside part in yellow caiman with yellow sewing.